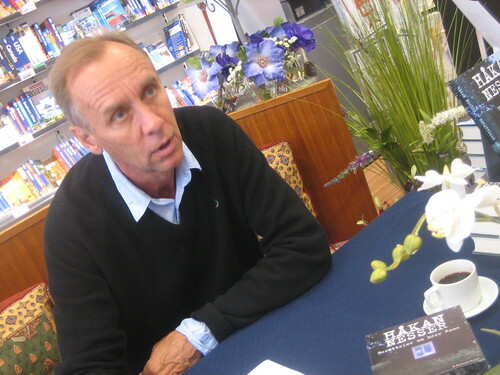 It was very much a “shall I, shan’t I?” kind of debate, until I had this odd dream on Tuesday morning about Håkan Nesser being annoyed with me, and me scrabbling round my handbag to find my business card to hand over. Then I knew I had to go. Håkan did a signing in one of the Halmstad bookshops yesterday, and as his name is on the rise in (English) translation, I felt it might be a good idea to attend. Unlike the rest of the world, I have not read any of Håkan’s numerous crime novels. We do have a copy in German somewhere, but that’s not much use to us. Adèle Geras recently read a couple of his books, so I sent her two Nesser DVDs. The detective, van Weeteren, is played by Sven Wollter, who’s been described as the most handsome man in Sweden. Adèle reckoned he looked like Jimmy Carter, so that’s that. Since my youth the Halmstad bookshops have renamed themselves, so I’m never sure which is which. To me they’ll always be Larsson’s or Meijel’s. The witch once had a holiday job in Meijel’s shop. The signing, however, was over at Larsson’s, where I understand the business is run by the third generation of Larssons, whereas I still think of the second generation as the “young Larsson”, since he’s a former pupil of Mother-of-witch. Time flies. Anyway, they did coffee for Håkan, and he chatted very nicely with his fans, and did not get angry with me, and my card was duly handed over. Now that he’s left New York after a couple of years, and has moved to London, I might run into him again. I now own two novels from Håkan’s new series of books. There was some confusion in the shop as to whether I wanted hardbacks or paperbacks, so we were back at the perennial snobbery of paperbacks not being proper books. I got one of each, but when will I find the time to read them? Och, Hej Håkan, om du läser det här. This entry was posted in Adele Geras, Authors, Blogs, Books, Bookshops, Crime, Film, Languages and tagged Håkan Nesser. Bookmark the permalink. Should be ‘et al, ‘ of course! Good to hear the other film was worth watching. Håkan without the ring means “the chin” in Swedish, so is doubly weird. I’m just so pleased to have finally sorted my umlauts, accents and any other funny stuff. And I’ll keep mentioning your name, Adèle, just for the fun of adding the accent at long last. I’ve just read two Nesser novels in a row. They were essentially the same book. Too formulaic. But I’d like to read his newer books to see if he’s gotten better (the books I read were from the 90s). I agree he’s nice looking, and I wanted to like his books more. I’ll try the newer ones.